FOR IMMEDIATE RELEASE: Lewiston, Maine (December 1, 2016) – The New England Fights (NEF) Professional Lightweight Title has been declared vacant by company executives after most-recent champion Devin Powell (8-1) signed a contract with the world’s largest mixed-martial-arts promotion, the Ultimate Fighting Championship (UFC). At the fight promotion’s next event, “NEF 27: RESURGENCE” on February 11, 2017, a four-man tournament will kick off with two bouts. The winners of those two bouts will compete against each other in the finals at “NEF 28” with the victor crowned the new lightweight champion. The vacating of the lightweight title has been a regular occurrence since the title’s inception. Powell is just the latest in a string of NEF 155-pound champions to get the call to the major leagues of the sport. The promotion’s first lightweight titleholder, Dez Green (18-5), was called up to Bellator just weeks after winning the belt. Green currently competes for another national promotion in Titan Fighting Championships. Bruce Boyington (14-9), the next athlete to hold the title, would also vacate it after several successful defenses when he was signed by World Series of Fighting (WSOF). 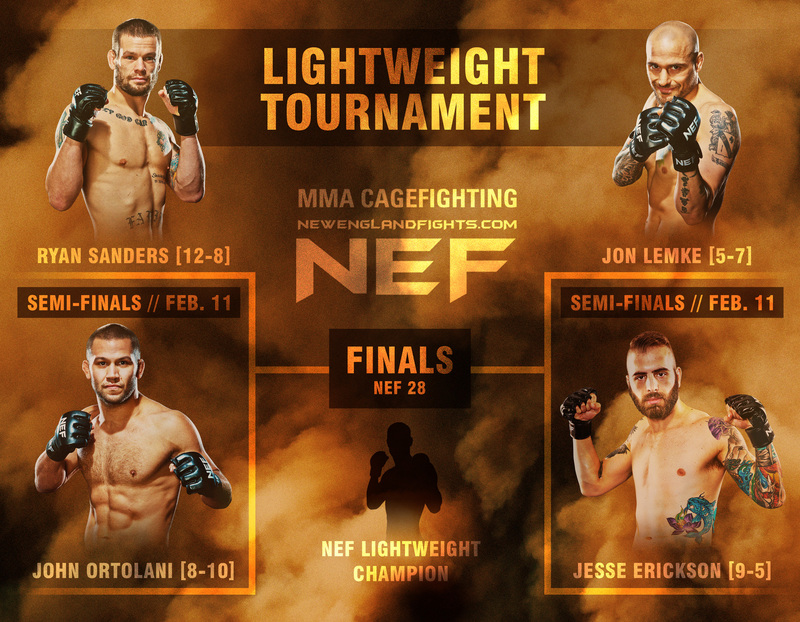 The two lightweight bouts scheduled for “NEF 27” will feature Ryan Sanders (12-8) taking on John Ortolani (8-10), as well as the long-awaited rematch between Jesse Erickson (9-5) and Jon Lemke (5-7). As noted, the victors of each bout will meet at “NEF 28” to determine a new 155-pound champion. Sanders is coming off two huge wins in the NEF cage in the second-half of 2016. In August, he defeated Derrick Kennington (12-8) by decision. Then, just last month, Sanders was victorious over Lemke via unanimous technical decision when the bout was stopped in the third round due to a deep cut suffered by Lemke. Sanders will have the opportunity to re-capture the title for his gym, Young’s MMA, following in the footsteps of teammate Boyington. In February, it will have been three years since John Ortolani stepped into the NEF cage. (Although, he did compete in the NEF boxing ring last September at “NEF 25.) A native New Englander, and a veteran of the regional MMA scene, Ortolani relocated to Florida two years ago where he has continued both his professional MMA and professional lacrosse careers. Of note, Ortolani submitted Boyington in the fall of 2012 in the first round of the original NEF Lightweight Title tournament. Erickson and Lemke were scheduled to rematch twice in 2016, but both bouts fell through due to injuries suffered by each athlete during training. The original fight took place as part of Bellator 93 in the spring of 2013. Lemke was victorious that night. Erickson would go on to challenge, unsuccessfully, Boyington for the lightweight strap in 2014, while Lemke would drop a very close split decision to Boyington earlier this year in his sole previous attempt to claim the gold. NEF’s next event, “NEF 27: RESURGENCE” takes place on Saturday, February 11, 2017 at 7 p.m. Tickets start at $25 and are on sale now at www.TheColisee.com or by calling the Colisee box office at 207.783.2009, extension 525.